With refrigerators an essential purchase for households, brands have looked to diversify their features and functionality in order to set themselves apart from the competition. With technology, user friendliness and convenience some of the biggest factors when it comes to new fridges, features such as ice makers and water dispensers have become the new battleground for many brands. In today’s market, most new models – over a certain price tag – now come with a water and ice dispenser, allowing families to get a cool glass of water straight from the fridge without opening the door – a handy function for those who only drink cold water, as well as for entertaining purposes. With plenty of models and brands now available with ice and water dispensers, finding one that will suit your household preferences, and budget, will depend on other features. Read on for our guide to fridges with ice and water dispensers, and find out what you can get for your money. Known across multiple industries, Bosch has expanded its operations from its original automotive heritage to include household appliances. Amongst its extensive range of products is the humble fridge, including bottom and top models, as well as the popular side-by-side systems available for all household sizes, regardless of how many hungry mouths you have to feed. Water dispensers aren’t available on some models, with the Serie 6 and Serie 8 fridges the best options for those after the feature. Both series come with a range of additional features and functions, including VitaFresh Plus, which will keep your fruits and veggies fresh for twice as long, according to Bosch, as well as NoFrost technology. Capacities will range between models, but Bosch may be a good option for your household regardless of how much space you need for the groceries. Fisher & Paykel has long been a respected brand within the home appliance community, with years within the industry as well as a wide range of products making it a go-to option for many consumers. 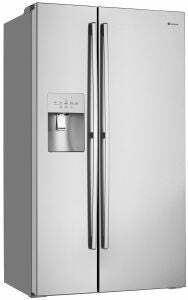 With a variety of fridges available, including integrated, French Door, bottom-mounted, as well side by side models, Fisher & Paykel gives consumers plenty of options for those after a water and ice dispenser, with the feature available across all model types. While Fisher & Paykel will have a water and ice dispenser available on at least one model per range, consumers will have to look at the other features of the fridge before deciding on which one to walk out the door with. If you’re after an ice maker however, the range becomes far less extensive, although each type of fridge will have a few options for consumers. Offering a cheaper option for consumers, Hisense still has a large range of fridge varieties and models to suit all household sizes, with French door, side-by-side, top and bottom mounted fridges all available in a range of capacity sizes and finishes. If the water dispenser and ice maker are the only defining parameters, then Hisense will be able to meet your requirements, with models across the entire range coming with the features. 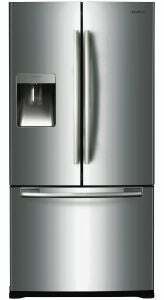 The water dispensers are less common though, with the French door range most likely to have what you desire. Other common features from Hisense models include LED displays with touch control, a super freeze function to keep the ice cream from melting on those hot days, as well as interior LED lighting to help with those late night fridge raids. A heavyweight of the home appliance and electronics markets, LG has a variety of fridges available for Australian consumers to choose from, with all styles and capacities catered for. LG’s fridge range includes both bottom and top mounted fridges, as well as the popular side-by-side and French door models, with integrated fridges also available to suit your kitchen aesthetic. Capacities also range from 223L up to 906L, with each available in a range of colours and finishes, including stainless steel models. For those after a water dispenser, the majority of LG’s French door range contains the feature, with LG catering for users by expanding the dispenser to fit a water bottle size container. Additionally, LG also offers digital controls for easier filling, as well as a childlock to prevent spills. 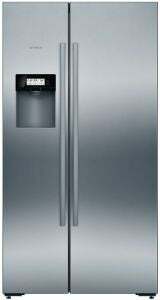 An electronics company that has been making moves into the home appliance market, Samsung has become an increasingly popular choice for households, with technological features making the simple fridge exciting to use. 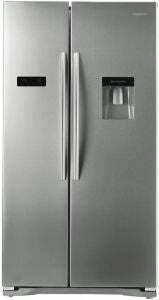 Samsung has a wide range of fridges to suit all styles and needs, with French door, side-by-side and traditional models available. All Samsung models come with Twin Cooling, allowing for regular cooling air flow throughout the fridge, keeping your food fresh and cold. The higher end models also offer the Family Hub feature, which is a display set up on the fridge door, allowing households to leave notes, order groceries as well as search the internet for recipes. Westinghouse is a common name in the fridge market, with the company providing possibly the largest range on the market for consumers to check out. Offering all types of finishes to suit your kitchen’s aesthetic, Westinghouse also offers a wide variety of large capacity models for larger households. For those after water and ice dispensers, the French door model may be the best option to consider, as there is more variety in terms of capacities and functions. Otherwise, consumers will still be able to grab a cold glass water from Westinghouse’s bottom mounted models. 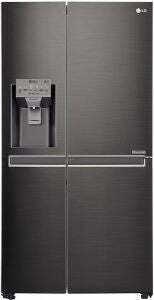 Is a water dispenser & ice maker worth the money? Water dispensers and ice makers are handy features to have, as they not only allow your family and guests to keep cool during those hot days, but they may also help you save energy in the long run, as there is no need to open the fridge door and allow the cool air to escape. If the only parameters you have for purchasing a new fridge are the water dispenser and ice maker, you may find the whole process confusing and stressful as fridges have evolved to offer more for households to use and enjoy. 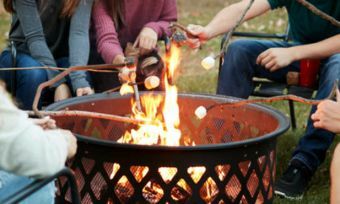 Capacity, energy efficiency, adjustable storage space and even display screens are all available across a range of models and brands, meaning that it’s best to do your research before you purchase. However, if you’re up to the task, there are plenty of brands and models available with water dispensers and ice makers, meaning you’ll have plenty to choose from.